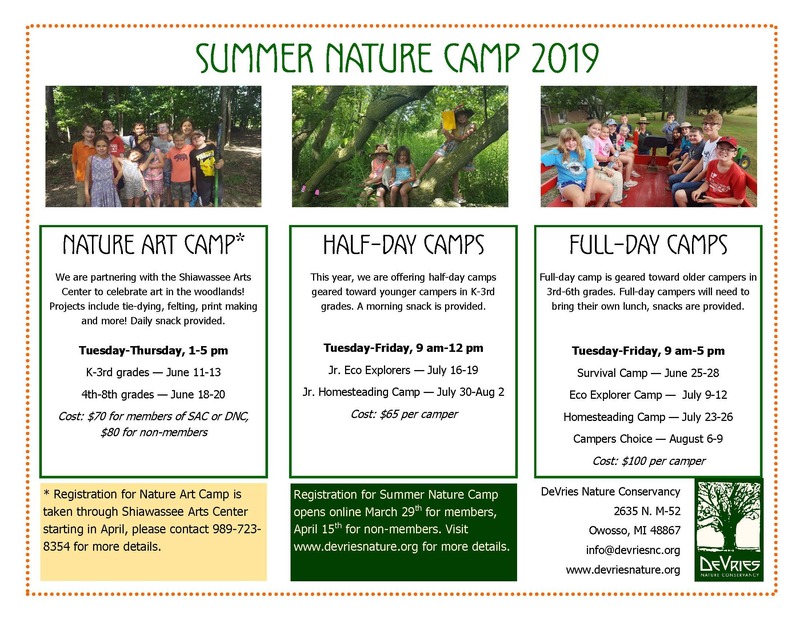 Join us at DeVries Nature Conservancy for 8 weeks of nature-themed summer camps! Each week will offer specific themes, snacks and activities to get your child outside. We are offering half-day and full-day camps. Half days begin at 9 am and end at 12 pm, while full days end at 5. Members of DeVries can register beginning March 29, and the general public beginning April 12. Our registration system refers to your children as "Guests." In the section titled "Who is registering for this event?" be sure to select "Not me but I'm registering __ others" and enter the number of children you're registering. You will then be prompted to enter some basic information for each "guest." If you're a member who's already set up your children as sub-members, you can skip this by selecting "Member guest - another person in your membership" for each; otherwise, select "Member guest - a non-member" and enter their information when prompted. We apologize if this seems confusing. We are using a new registration system. Don't hesitate to call if you need help! Please call our office if you need to cancel your registration. Learn important survival skills to help you survive in an emergency. In this week we will be learning how to start fires safely (and with primitive tools), gather water, use a compass, and so much more! During our Eco Explorers week, we will be exploring every part of our grounds! We will learn about early explorers and naturalists, investigate new areas, and make our own observations in nature. During our Jr. Eco Explorers week, we will be exploring every part of our grounds! We will learn about early explorers and naturalists, investigate new areas, and make our own observations in nature. Learn to live off the land at our Homesteading Camp. During the week, we will be preserving foods from our gardens, making our own snacks, making soaps and candles, and doing other projects that help us be self-sufficient on the land. Learn to live off the land at our Jr. Homesteading Camp. During the week, we will be making our own snacks, making soaps and candles, and doing other projects that help us be self-sufficient on the land. Campers will choose their daily activities, snacks, and crafts during our Camper's Choice week. This week is surely to be fun!